The MakerLab Fusion took place between 1st and 2nd of July 2011 in the Workshop Hangar at the Fusion Festival. For the Fusion festival, we wanted to focus on Sound and Image. We will bring expertise in making instruments and music/visuals and invite fusion visitors to make their own. 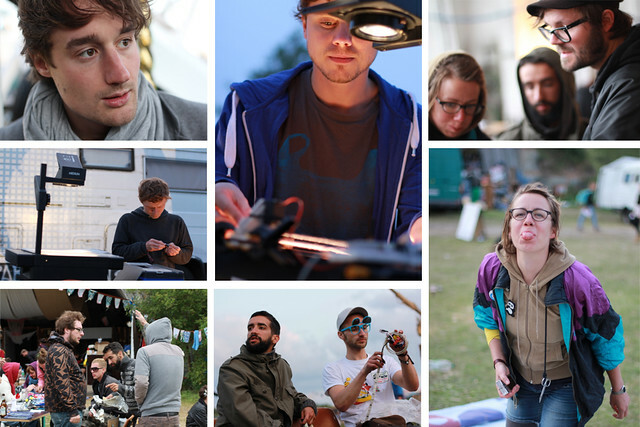 The workshops are based on open source electronics instruments and DIY philosophy. The workshop leaders will help people to create simple devices (according to their initial expertise, the attendants can choose what level they want to get involved at) to produce sound or to work the sound produced by another device. In a very similar way, the devices can also be use to VJ images, produce analogue projections and work on them. At the MakerLab will provide attendants with the possibility not just to enjoy the music and the visuals, but to create their own and even to play together with other artists. We also would like to invite Djs, producers and Vjs to come along and show participants what you can do with the instruments!! DIY SYNTH & CIRCUIT BENDING: Synth have been a part of electronic music since its origins. We will help people to create their own either from a basic pcb board or hacking children electronic-instruments. The diy-synth generate a signal, which you can combine to produce different noices and even music! Friday 1st of July at 18:00 in the Workshop Hangar. DIY-VJ WORKSHOP: We are bored of the all the same club visuals made with software and laptops. That´s why we will set up a workshop to create visuals in an analogue way. Together with hacked overhead projectors, dia-positive projector and some lightmasked spots participants create a visual show for the evening that is performed outside of the hangar. By passers are invited to join creating and watching the show that stands in a row with psychedelic club visuals of the 60s, russian shadow theatre and contemporary paper craft. Upcycle it! During this workshop you will learn, share and investigate the possible REUSE of PVC banner, plastic bottle-tops and inner bike tube by making them into a great bag. No electricity needed. We have all the tools and trash you need! 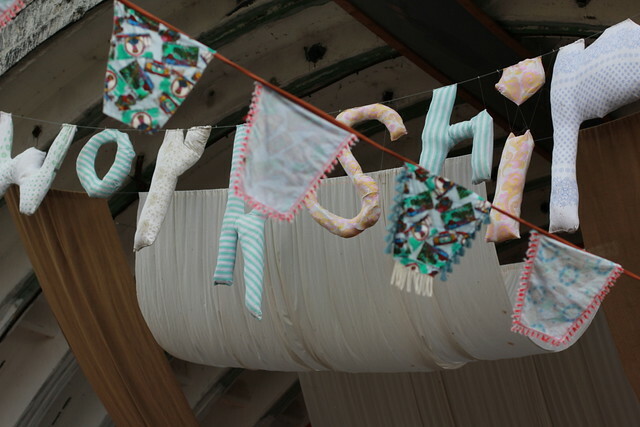 …..we will also bring lots of trash for awesome Trash Fashion. From VHS tapes till candy wraps! Feel free to bring your favourite trash and Upcycle it into treasure. Friday 1st and Saturday 2nd of July at 18:00 in the Workshop Hangar. DIY DUBPLATE MASTERING: Cutting dubplates is essential to contempory dance music since the late 60s. We will give the opportunity to cut drony, noisy dubplates out of wooden, plastic and soft matrices we will bring with us. With boxcutters, scalpels and old turntables participants shizzle little carves that create sounds by playing on a turntable. Saturday 2nd of July at 18:00 in the Workshop Hangar. The MakerLab Fusion happened at the Workship (workshop hangar) The environment this time was musical and artistic raher than pure design. We decide to focus on topics that would be of interest for the festival visitors. This time, rather than a full day on going experimentation we decide to fix the hours so that people could plan it into their days, but leave it open end so that we didn’t limit the fun. Most workshops where experimentations, as we our self had just tried a couple of times, but thought it would be fun to share the learning process rather than bringing a set structure. At the same time most process where very simple and included just few steps to achieve the final product. While the circuit bending and synth was totally open, for the Pfandtasche Trial&Error had prepare a set of instructions so that people could do it on their own. It was very interesting to see both approaches because the outputs where very different. The circuit bending and synth workshop transformed into an open experimentation with the toys brought by Jossi and Philip which later evolved into an open jam session with people playing the different noises into some cool tunes. For the pfandtasche, people could follow the instructions and make almost by them self the up-cycled bags, and the best of all is that we observed how, once somebody had made its bag, could help new visitors to make theirs. And therefore distributing the process of teaching and making! If you bring more complex process it is easier for people to receive a set of instructions with wich they can start playing, and then to have a series of plug-templates which allows them to evolve the products in different directions. But most important of all is to allow and welcome people to take their own initiative and go into un-expected directions!! Commons lisence: Attribution, Non Commercial, Share Alike.